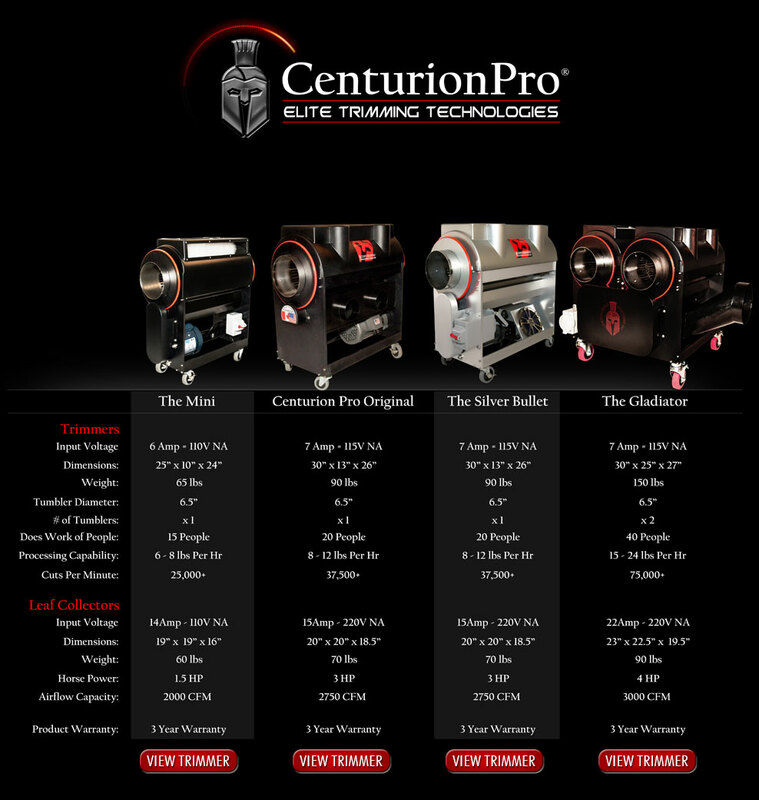 The CenturionPro Brand is the most sought after machine on the market and is currently being shipped worldwide to growers who demand quality, durability, and accountability. CenturionPro Solutions holds its customer service to the highest standards and you are welcome to contact us. We are here to provide assistance with any and all of your questions and concerns. Centurion Pro Blower (Original) BLOWER add on or replacement part for the The..
Centurion Pro Blower (CP1 & BULLET) BLOWER Centurion Pro Silver Bullet 3hp Blower f..
Centurion Pro Blower 4hp (GLADIATOR) ENTER PROMO CODE MINIBOOM AT CHECK OUT FOR DISCOU..
Centurion Pro Blower (MINI) Blower (MINI) add on or replacement part for the The Centur..
Centurion Tabletop 1 hp blower Centurion Tabletop 1 hp blower replacement blower for the cent..
Centurion Pro Quantanium Dry Tumbler Description Standard Quantanium Dry Tumbler ..
Centurion Pro QuanTanium wet tumbler Description Quantanium Wet Tumbler The ..
Centurion Pro Electropolish Dry Tumbler The Centurion Pro Dry Tumbler is a superior pro..
Centurion Pro ELECTROPOLISH Wet Tumbler The Wet Tumbler is an elite CenturionPro p..
Centurion Pro Bed Bar Blade The CenturionPro Bed Bar Blade is designed to work with bot..
Centurion Pro BRUSH ASSEMBLY Centurion Pro BRUSH ASSEMBLY Includes the brush, brush bar, and ..
Centurion Pro Reel Blade replacement part CenturionPro Reel Blade replacement..
Centurion Pro Original Baldor Motor lives up to its name. It utilizes cutting-edge technology, makin..
Centurion Pro Gladiator Replacement Motor Gladiator replacement motor for all Centurion..
Centurion Pro Silver Bullet Replacement Motor Centurion Pro Silver Bullet Replacement Motor&n..
Centurion Pro MINI Replacement motor Replacement motor for all Centurionpro MINI Trimme..
Centurion Pro Gladiator Cover This cover is specially designed for the CenturionPro Gla..
Centurion Pro Silver Bullet Cover This cover is specially designed for the CenturionPro..
Centurion Pro Kief Collection System Keif is becoming wildly popular due to the rise of..
Centurion Pro Outter Bag 25 micron mesh THE CENTURION PRO INNER AND OUTTER BAGS HAVE BEEN D..
Centurion Pro Mini Plastic Cover Our Mini Plastic Cover is the perfect finishing touch ..
Centurion Pro Trimmer Tumbler O Ring Tumbler O Ring for the Tabletop, CenturionPro® ..
Adjustable V-Link Belt for the CenturionPro® Mini, The CenturionPro®, & the Cen..
Centurion Pro Start and Running Capacitors Works for the Centurion Pro Tabletop , The Centurion P..
Centurion Pro Tabletop Drive Belt replacement part for the centurion pro tabletop trimmers. ..
CAM FOLLOWERS (EACH) Plastic Cam Follower with rubber O-Ring. ..
Centurion Pro Drive Belt - Small DESCRIPTION Gladiator Drive Belt The Gladiator&n..
Centurion Pro Drive Belt - Small Adjustable V-Link Belt for the CenturionPro® ..
Centurion Pro 2.5" WHEELS (PAIR) These durable wheels are customized to allow simplistic..
Centurion Pro 3.5" WHEELS (PAIR) These durable wheels are customized to allow the seamle..
Centurion Pro Pre-Filter Nylon Bag The CenturionPro Pre-Filter Nylon Bag was created wi..
Centurion Pro Silencer for Silver Bullet, Original and Mini Even the best bud trimmer m..
Centurion Pro DIVERTER (CP1 & BULLET) Diverter for Centurion Pro Original and Silver Bull..